Whether you’re visiting Boulder for your freshman’s Parents Weekend or you wanted a break from the hustle and bustle of Denver, you chose an excellent destination. There’s no shortage of activities to try in Boulder — we’ve lived here for nearly four decades and we still haven’t checked everything off the list! If you’re in town for a day or for a weekend, use these five suggestions to anchor your itinerary. Then, be sure to plan your next visit so you can keep exploring all that Boulder has to offer. Chautauqua Park is as iconic to Boulder as the Washington Monument is to D.C., the Statue of Liberty is to New York, and the Grand Canyon is to Arizona. 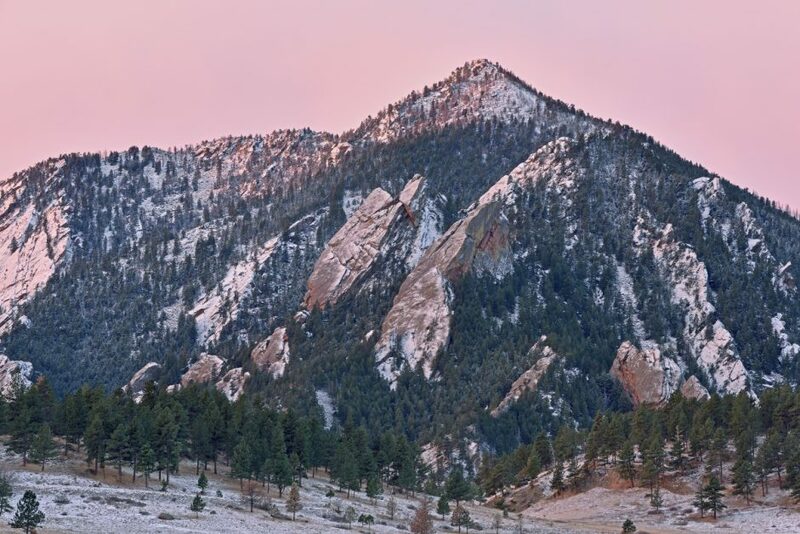 You can’t visit Boulder without at least checking out Chautauqua — if not going for a hike up one of the Flatirons. Even if you’re not up for hiking all the way up the Flatirons trail, Chautauqua has a “choose your own adventure” trail system. You can hike for as long or as short as you want and still see the beautiful sights of Boulder. There’s also a visitor’s center and an area for picnics, so you have a chance to leisure as well. Visiting a tea factory might not be the first activity you add to your Boulder list, but Celestial Seasonings isn’t any old tea factory. If you have a rainy day or want to take a break from high-altitude hikes, reserve a space at the free Celestial Seasonings tour. You’ll bounce around from the Peppermint Room to the gift shop and everything in between. Plus, you get free samples throughout the duration of the tour. Forgot to bring that rain jacket for afternoon summer showers? Want a postcard that displays the beauty of the Flatiron you just hiked up? The Pearl Street Mall is an outdoor shopping experience. Filled with cafes, book shops, clothing stores, and Boulder street performers, the mall is the perfect destination for a half-day in Boulder. If you’re in town on Saturday, make sure to stop by the Boulder County Farmers Market. Located just on the outskirts of the Pearl Street Mall, the Farmers Market is a mecca for the tastiest local produce, beautiful hand-crafted goods, and great people watching. Boulder is known for its focus on local, organic, non-GMO, etc. living, and the Farmers Market is one of the best ways to truly experience this aspect of Boulder culture. Rent a bike to avoid the parking hassle and enjoy all the free samples. Boulder is also home to the thriving University of Colorado, which means the town has a ton of sporting events, concerts, lectures, and other academic-focused events. Check the University of Colorado events schedule before your visit, so you can get tickets in advance if needed. If you can’t make an event, check out a University tour offered for free throughout the academic year. Eldorado Canyon (referred to as “Eldo” by locals), is one of the most scenic spots in Colorado, and it’s just a few minutes outside of Boulder proper. If you have climbing gear, take advantage of Eldo’s numerous routes. For those who just want to hike and take in the sights, there are options for that as well. Parking at Eldo can be difficult, to say the least, so try to carpool and visit during off-hours. Boulder isn’t known for being the most affordable city in Colorado, but it actually has a thriving thrift shop scene. Whether you want to purchase unique used furniture or need a new outfit for your next disco party, the thrift shops of Boulder have you covered. No Place Like Home, located on antique row, offers an incredible selection of used and consigned furniture. It’s a fun place to peruse — especially because you’ll find high-quality Boulder furniture at used furniture store prices. Enjoy your visit to Boulder, and be sure to visit our used furniture store during your trip!